MSI introduces OC Certified, a new standard that is the baseline for the company's new overclocking motherboards. The first motherboard in the OC Certified lineup is the Z77 MPOWER. OC Certified is MSI's OC testing procedure where each Z77 MPOWER mainboard tested for stability with a 24-hour Prime95 stress test. OC Performance means all OC Certified tests are run at a minimum of 4.6 GHz CPU speed. Stable Power is tested by running Prime95 for 24-hours in these conditions. The PWM cooling test ensures that, even without airflow in a high-temperature location (30°C) without airflow from a CPU cooler..
OC Certified is a major extension of MSI's Military Class III certification. Military Class III certified mainboards already have their component quality tested in rigourous tests to ensure all-round stability. OC Certified puts these components to the test. When an MSI Z77 MPOWER passes the OC Certified test it is able to run in overclocked conditions in high temperatures with little to no airflow. OC results will of course vary with the component quality of the entire system, but at least you can count on your mainboard not being the limiting factor. 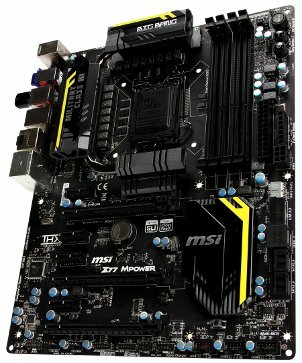 MSI's first OC Certified mainboard is the Z77 MPOWER. Built from the ground up for overclocking the new MSI Z77 MPOWER is designed to deliver extreme CPU and memory performance. When combined with MSI's Lightning series graphics cards, it can deliver unprecedented performance.